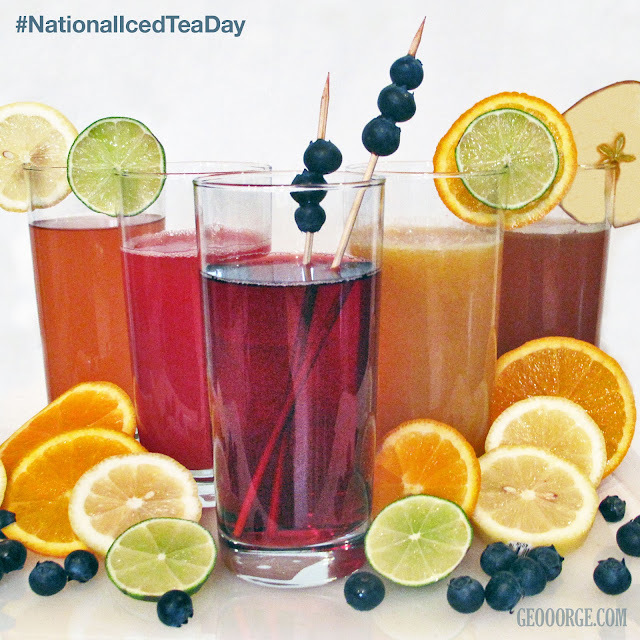 Welcome to National Iced Tea Day. Yum! We just got a tea machine in our office for the summer and we are making a great use out of it. Check out some recipes below for a little tasty variation of your typical Arizona sun tea. You can make this with a little extra something something if you know what I mean or you can keep it simple and sober. Start with half a glass of unsweetened tea then add half a glass of apple juice with a splash of lemon to taste. Enjoy. They say the red fruits are energizing and hold anti-aging benefits. Can I prove that? No. I just love the way they taste. Start with half a glass of unsweetened tea then add pureed strawberries mixed with pomogranite-cranberry juice. Add skewered blueberries for an aesthetic touch. If you know me you know how much I love tropical fruit and citrus. It's really a weakness. Start with half a glass of unsweetened tea then add an extracted mixture of mango, pineapple, peach and apricot. Put your suit and glasses on and go sit by the pool with this one! This one is for my fancy friends. Start with half a glass of unsweetened tea and add extracted watermelon. Cut a lime in half and use one half to squeeze into the drink and the other half to slice and perch on the side of the glass. Serve with an accent. A nice twist to the traditional Arnold Palmer! Start with half a glass of unsweetened tea then add Raspberry Lemonade (1 Part Lemon, 2 Parts Orange, 3 Parts Raspberries). YUM!